A LITERARY MAGAZINE is a periodical devoted to literature in a broad sense. Literary magazines usually publish short stories, poetry and essays along with literary criticism, book reviews, biographical profiles of authors, interviews and letters. Literary magazines are often called literary journals, or little magazines, terms intended to contrast these with larger, commercial magazines. Book review magazines - Wikipedia. How one article capsized a New York literary institution - "A controversial piece by Jian Ghomeshi in the New York Review of Books cost editor Ian Buruma his job and sparked a debate about free speech." The Best Literary Magazines & Journals - AbeBooks.com. Top 50 Literary Magazines - Every Writer's Resource. Allgemeine Literatur-Zeitung - war eine 1785 in Jena gegründete und 1849 in Halle eingestellte Literaturzeitschrift, die mit dem Ziel auf den Markt gebracht wurde, die gesamte aktuelle Literaturproduktion jener Zeit zu rezensieren und kritisch zu begleiten. Sie wurde zur auflagenstärksten und einflussreichsten deutschsprachigen Zeitung dieser Art in ihrer Zeit. American Review - literary journal published from 1967 to 1977. American Review printed traditional and experimental fiction, poetry, and nonfiction essays and journalism. Asymptote - "Exciting new international journal dedicated to literary translation and bringing together in one place the best in contemporary writing." Athenaeum - literary magazine published in London, England from 1828 to 1921. It had a reputation for publishing the best writers of the age. AthenÄum - was a literary magazine established in 1798 by August Wilhelm and Karl Wilhelm Friedrich Schlegel. It is considered to be the founding publication of German Romanticism. Blast - (1914-1915). Was the short-lived literary magazine of the Vorticist movement in Britain. Broom - "An International Magazine of the Arts." Was a little magazine founded by Harold Loeb and Alfred Kreymborg and published from November 1921 to January 1924. Initially, the magazine was printed in Europe, first in Rome and then in Berlin, with the intention of bringing new, avant-garde art back to the U.S.
Cahiers d'art - since 1926. French artistic & literary journal. The journal has been noted for the quality of its articles and illustrations which promoted Modern Art in France for over thirty years. Cahiers d'Art carries no advertising and is published on an irregular schedule. Claremont Review of Books - since 2000. Quarterly review of politics and statesmanship published by the Claremont Institute. Many consider it a conservative intellectual answer to the liberal New York Review of Books. Close Up - was an influential literary magazine devoted to film, published by the Pool Group between 1927 and 1933. "It was the brain child of Kenneth Macpherson, a young man of independent means, not a little talent, and quite a lot of personal charm". The monthly magazine, founded at the group's 'headquarters' in Territet, Switzerland would be dedicated to "independent cinema and cinema from around the world". Cornhill Magazine - (1860–1975) was a Victorian magazine and literary journal. Der Sturm - was a German art and literary magazine covering Expressionism, Cubism, Dada and Surrealism, among other artistic movements. It was published between 1910 and 1932. Der Teutsche Merkur - (English: The German Mercury) was a literary magazine published and edited by Christoph Martin Wieland. The magazine was modeled on French magazine, Mercure de France. The first issue appeared in 1773. He published and edited the magazine until 1790. Wieland used the Merkur as an organ to advance the Enlightenment and to provide a platform to support literary taste. In 1790 the title was changed to Der neue teutsche Merkur and continued publication until 1810. Die Horen - was a monthly German literary journal published from 1795 to 1797. It was printed by the Cotta publishing house in Tübingen and edited and run by Friedrich Schiller. Many and partially antagonistic prominent figures in German culture of the time contributed, among them Johann Jakob Engel, Fichte, Goethe, Herder, Alexander von Humboldt, Wilhelm von Humboldt, Friedrich Heinrich Jacobi, Johann Heinrich Meyer, August Wilhelm Schlegel, and Karl Ludwig von Woltmann. The journal formed the cornerstone of Weimar Classicism and exerted a great influence onto German intellectual history. Die literarische Welt - since 1925. "Unabhängiges Organ für das deutsche Schrifttum." Encounter - was a literary magazine, founded in 1953 by poet Stephen Spender and journalist Irving Kristol. The magazine ceased publication in 1991. Published in the United Kingdom, it was a largely Anglo-American intellectual and cultural journal, originally associated with the anti-Stalinist left. The magazine received covert funding from the Central Intelligence Agency, after the CIA and MI6 discussed the founding of an "Anglo-American left-of-centre publication" intended to counter the idea of cold war neutralism. Epoch - triannual American literary magazine founded in 1947 and published by Cornell University. Europe - "Revue litteraire mensuelle." French literary magazine founded in 1923. Everybody's Magazine - was an American magazine published from 1899 to 1929. Initially, the magazine published a combination of non-fiction articles and new fiction stories. Evergreen Review - U.S.-based literary magazine founded by Barney Rosset, publisher of Grove Press. It existed in print from 1957 through 1973, and was re-launched online in 1998. FLAVORWIRE - "Cultural News and Critique." Network of culturally connected people, covering events, art, books, music, and pop culture the world over. Highbrow, lowbrow, and everything in between: if it's compelling, we're sharing it. Frankfurter gelehrte Anzeigen - waren eine Literaturzeitschrift, die von 1772 bis 1790 in Frankfurt am Main erschien. Sie gilt als wichtiges Organ der Literaturkritik in der Periode des Sturm und Drang, vor allem in ihrem ersten Jahrgang. Ihre Redakteure waren anfangs Johann Heinrich Merck und Johann Georg Schlosser, später Karl Friedrich Bahrdt. Zu ihren Rezensenten gehörten Johann Wolfgang Goethe und Johann Gottfried Herder. Fraser's Magazine - was a general and literary journal published in London from 1830 to 1882, which initially took a strong Tory line in politics. Gil Blas - (1879-1938). Was a Parisian literary periodical. Harper's Magazine - since 1850. Monthly magazine of literature, politics, culture, finance, & the arts. Horizon - "A Review of Literature and Art." Was an influential literary magazine published in London, UK, between 1940 and 1949. It was edited by Cyril Connolly, who made it into a platform for a wide range of distinguished and emerging writers. Hound & Horn - (1927-1934). Was a literary quarterly founded by Harvard undergrads. Kirkus Reviews - since 1933. American book review magazine. L'Esprit nouveau - (1920-1925). Revue consacrée à l'esthétisme contemporain dans toutes ses manifestations architecture, peinture, littérature, fondée par Le Corbusier et Amédée Ozenfant en 1920. La Revue Blanche - was a French art and literary magazine run between 1889 and 1903. Some of the greatest writers and artists of the time were its collaborators. Le Figaro littÉraire - since 1946. Hebdomadaire de 8 pages en supplément du quotidien Le Figaro qui parait chaque jeudi. Les Nouvelles littÉraires - (1922-1985). Les SoirÉes de Paris - (1912-1914). Une revue littéraire et artistique française fondée en février 1912 par Guillaume Apollinaire & quatre de ses proches - André Billy, René Dalize, André Salmon & André Tudesq. Library Journal - since 1876. Trade publication for librarians. LITERARY WEEKLY - "World Literary Review." London Review of Books - since 1979. British journal of literary and intellectual essays. Published semi-monthly (24 times a year), it has the largest circulation of any literary magazine in Europe and is considered the leading journal edited by a woman in the Western world. Longform.org - since 2010. Recommends new and classic non-fiction from around the web. Articles can be read on a browser or saved to read later with Readability, Instapaper, Pocket or Kindle. Macmillan's Magazine - monthly British magazine from 1859 to 1907. The magazine was a literary periodical that published fiction and non-fiction works from primarily British authors. Nord-Sud - was a magazine edited by Pierre Reverdy and published in Paris in 16 numbers (14 issues) between March 1917 and October 1918. In addition to the editor, authors contributing included Guillaume Apollinaire, Louis Aragon, André Breton, Max Jacob, Philippe Soupault, Paul Dermée, Tristan Tzara, and Justin Frantz Simon. North American Review - "The Oldest Literary Magazine in the United States." Founded in Boston in 1815, the North American Review is the oldest and one of the most culturally significant literary magazine in the United States. Contributors include important nineteenth-century American writers and thinkers such as Ralph Waldo Emerson, Harriet Beecher Stowe, Frederick Douglass, Edith Wharton, and Charlotte Perkins Gilman; and twentieth-century writers like William Carlos Williams, John Steinbeck, Thomas Wolfe, William Saroyan, and Flannery O’Connor. Nouvelle Revue FranÇaise - (NRF, or The New French Review in English) is a literary magazine based in France. The magazine was founded in 1909 by a group of intellectuals including André Gide, Jacques Copeau, and Jean Schlumberger. In 1911, Gaston Gallimard became editor of the revue, which led to the founding of the publishing house, Éditions Gallimard. During World War I its publication stopped. The magazine was relaunched in 1919. Established writers such as Paul Bourget and Anatole France contributed to the magazine from its early days. The magazine's influence grew until, during the interwar period, it became the leading literary journal, occupying a unique role in French culture. The first published works by André Malraux and Jean-Paul Sartre were in the pages of the Revue. Partisan Review - (1934-2003). Was a small circulation quarterly "little magazine" dealing with literature, politics, and cultural commentary published in New York City. Poetry - published in Chicago since 1912, is one of the leading monthly poetry journals in the English-speaking world. PUBLISHERS WEEKLY | PW - since 1872. American weekly trade news magazine targeted at publishers, librarians, booksellers and literary agents. Published continuously since 1872, it has carried the tagline, "The International News Magazine of Book Publishing and Bookselling". With 51 issues a year, the emphasis today is on book reviews. Quarterly Review - was a literary and political periodical founded in March 1809 by the well known London publishing house John Murray. It ceased publication in 1967. Revue de Paris - (1829-1970). French literary magazine. Scribner's Magazine - was an American periodical published by the publishing house of Charles Scribner's Sons from January 1887 to May 1939. Shenandoah - since 1950. Major literary magazine published by Washington and Lee University. Story - (1931-1967 / 1989-1999). Showcasing short stories by new authors. STRAND MAGAZINE - the magazine for mystery & short story lovers. The American Mercury - American magazine published from 1924 to 1981. It was founded as the brainchild of H. L. Mencken and drama critic George Jean Nathan. The magazine featured writing by some of the most important writers in the United States through the 1920s and 1930s. After a change in ownership in the 1940s, the magazine attracted conservative writers. The Anglo-Saxon Review - quarterly miscellany edited by Lady Randolph Churchill, and published in London by John Lane. It was short lived, running from June 1899 to September 1901. THE ATLANTIC - founded (as The Atlantic Monthly) in 1857 in Boston, Massachusetts, now based in Washington, D.C. It was created as a literary and cultural commentary magazine, growing to achieve a national reputation as a high-quality review with a moderate worldview. As the former name suggests, it was a monthly magazine for 144 years until 2001, when it published eleven issues; it published ten issues yearly from 2003 on, dropped "Monthly" from the cover starting with the January/February 2004 issue, and officially changed the name in 2007. The Atlantic features articles in the fields of the arts, the economy, foreign affairs, political science, and technology. The Bloomsbury Review - nationally distributed literary magazine founded by Thomas Auer (1953–2003) in Denver, Colorado in 1980. It focuses on small, regional, university, and international presses, as well as "smaller" titles from large publishers. The Book Collector - founded in 1952 by Ian Fleming. Published quarterly. Online resource: a place where librarians, book collectors and booksellers meet. "The only journal in the world that deals with book collecting, but it is much more than that – a bridge that joins together collectors, librarians and booksellers, and all who are interested in books, to have, to read, to enjoy in any way." The Bookman (London) - was a monthly magazine published in London from 1891 until 1934 by Hodder & Stoughton. It was a catalogue of the current publications that also contained reviews, advertising and illustrations. The Bookman (New York) - (1895-1933). Was a literary journal. Its first editor was Harry Thurston Peck, who worked on its staff from 1895 to 1906. With the journal's first issue in February 1895, Peck created America's first bestseller list. The lists in The Bookman ran from 1895 until 1918, and is the only comprehensive source of annual bestsellers in the United States from 1895-1912, when Publishers Weekly began publishing their own lists. THE BOOKSELLER - since 1858. British magazine reporting news on the publishing industry. The Calendar of Modern Letters - (1925-1927). Was a short-lived British literary review journal. The Criterion - was a British literary magazine published from October 1922 to January 1939. It was created by the poet, dramatist, and literary critic T. S. Eliot who served as its editor for its entire run. The Dial - (1840-1929). Was an American magazine published intermittently from 1840 to 1929. In its first form, from 1840 to 1844, it served as the chief publication of the Transcendentalists. In the 1880s it was revived as a political magazine. From 1920 to 1929 it was an influential outlet for modernist literature in English. The Double Dealer - (1921-1926). Was a short-lived but influential New-Orleans-based literary journal of the 1920s. The Egoist - was a London literary magazine published from 1914 to 1919, during which time it published important early modernist poetry and fiction. In its manifesto, it claimed to "recognise no taboos," and published a number of controversial works, such as parts of Ulysses. Today, it is considered "England's most important Modernist periodical." The English Review - was a literary magazine published in London from 1908 to 1937. At its peak, the journal published some of the leading writers of its day. The Harvard Monthly - was a literary magazine of Harvard University in Cambridge, Massachusetts, beginning October 1885 until suspending publication following the Spring 1917 issue. THE LITERARY REVIEW | TLR - since 1957. "An International Journal of Contemporary Writing." Its many special issues have introduced new fiction, poetry, and essays from many nations, regions, or languages to English readers. The Little Review - American literary magazine founded by Margaret Anderson, published literary and art work from 1914 to May 1929. With the help of Jane Heap and Ezra Pound, Anderson created a magazine that featured a wide variety of transatlantic modernists and cultivated many early examples of experimental writing and art. The New Age - was a British literary magazine, noted for its wide influence under the editorship of A. R. Orage from 1907 to 1922. The New English Weekly - (1932-1942). Was a leading review of "Public Affairs, Literature and the Arts." The New Freewoman - (1913). Was a monthly London literary magazine. THE NEW YORK REVIEW OF BOOKS - since 1963. Fortnightly magazine with articles on literature, culture and current affairs. The New York Times Book Review - since 1896. Weekly paper-magazine supplement to The New York Times in which current non-fiction and fiction books are reviewed. It is one of the most influential and widely read book review publications in the industry. The Little Review - American literary magazine founded by Margaret Anderson, published literary and art work from 1914 to May 1929. The Paris Review - quarterly literary magazine established in Paris in 1953 by Harold L. Humes, Peter Matthiessen, and George Plimpton. In its first five years, The Paris Review published works by Jack Kerouac, Philip Larkin, V. S. Naipaul, Philip Roth, Terry Southern, Adrienne Rich, Italo Calvino, Samuel Beckett, Nadine Gordimer, Jean Genet and Robert Bly. The headquarters moved from Paris to New York City in 1973. THE RUMPUS - since 1992. Visually resembling the New York Post, Rumpus is a controversial, humorous publication with content ranging from Yale campus gossip to investigative reporting. The Saturday Evening Post - since 1821. Bimonthly American magazine. From the 1920s to the 1960s, it was one of the most widely circulated and influential magazines for the American middle class, with fiction, non-fiction, cartoons and features that reached millions of homes every week. The Smart Set - (1900-1930). Literary magazine founded in America in March 1900 by Colonel William d'Alton Mann. During its heyday under the editorship of H.L. Mencken and George Jean Nathan, The Smart Set offered many up-and-coming authors their start and gave them access to a relatively large audience. The Southern Review - since 1935. Quarterly literary magazine. It publishes fiction, poetry, critical essays, and excerpts from novels in progress by established and emerging writers and includes reproductions of visual art. The Strand Magazine - (1891-1950). Was a monthly magazine founded by George Newnes, composed of short fiction and general interest articles. 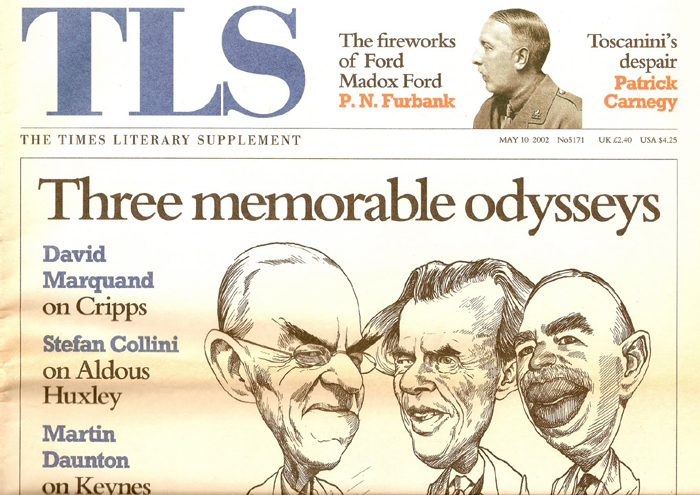 THE TIMES LITERARY SUPPLEMENT | TLS - since 1902. "The leading international forum for literary culture." The TLS first appeared in 1902 as a supplement to The Times, but became a separate publication in 1914. Many distinguished writers have been contributors, including T. S. Eliot, Henry James, and Virginia Woolf, but reviews were normally anonymous until 1974. From 1974, signed reviews were gradually introduced during the editorship of John Gross. The Transatlantic Review - was an influential monthly literary magazine edited by Ford Madox Ford in 1924. The magazine was based in Paris but was published in London by Gerald Duckworth and Company. Although it published only 12 issues—one in each month in 1924—the magazine had an influential impact on early 20th-century English literature by publishing works such as an early extract from James Joyce's Finnegans Wake. Time & Tide - (1920-1986). British weekly political and literary review magazine founded by Margaret, Lady Rhondda. Transatlantic Review - (1959-1977). Was a literary journal founded and edited by Joseph F. McCrindle in 1959, and published at first in Rome, then London and New York. McCrindle revived the title of the original Paris Transatlantic Review founded by Ford Madox Ford in 1924. Transition - (1927-1938). Was an experimental literary journal that featured surrealist, expressionist, and Dada art and artists. View - was an American literary and art magazine published from 1940 to 1947 by artist and writer Charles Henri Ford, and writer and film critic Parker Tyler. The magazine is best known for introducing Surrealism to the American public. The magazine was headquartered in New York City. Yale Literary Magazine - founded in 1836. The oldest literary magazine in the United States and publishes poetry and fiction by Yale undergraduates twice per academic year.